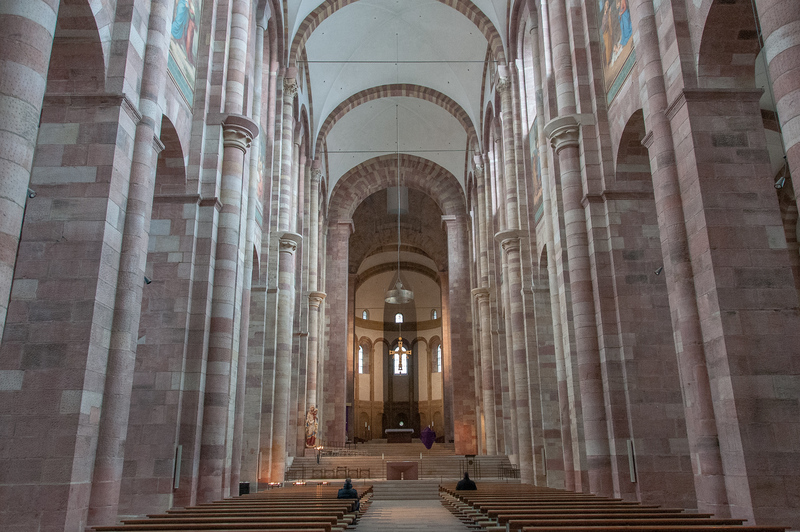 Speyer Cathedral exerted a considerable influence not only on the development of Romanesque architecture in the 11th and 12th centuries, but also on the evolution of the principles of restoration in Germany, in Europe, and in the world from the 18th century to the present. 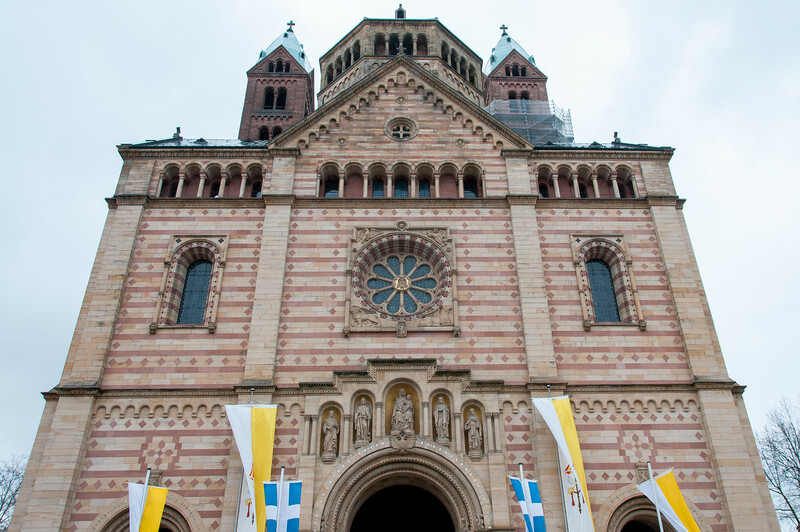 The cathedral, along with those of Worms and Mainz, is a major monument of Romanesque art. It is, by virtue of its proportions, the largest, and, by virtue of the history to which it is linked (the Salic emperors made it their place of burial), the most important. The cathedral, dedicated to St Mary and St Stephen, was founded by Conrad II and was built essentially between 1030 and 1106. It incorporates the general layout of St Michael of Hildesheim and brings to perfection a type of plan that was adopted generally in the Rhineland. This plan is characterized by the equilibrium of the eastern and western blocks and by the symmetrical and singular placement of the towers which frame the mass formed by the nave and the transept. Under Henry IV renovations and extensions were undertaken. Speyer Cathedral is the first known structure to be built with a gallery that encircles the whole building. The system of arcades added during these renovations was also a first in architectural history. Speyer Cathedral is the largest Romanesque cathedral in the world and is the burial site for eight different German emperors and kings. Despite its Romanesque origins, there are many additions to the cathedral which have changed its original design, including 18th and 19th-century extensions to the facade and towers. The interior of the cathedral is shockingly bare with most of the original artwork and paintings were gone. Renovations have cleaned the interior stone to such a degree that it almost looks new, despite some of it being almost 1,000 years old. One unique tradition you’ll find at Speyer is the large bowl (domnapf) in the front of the building near the plaza. That used to mark the boundary line between the church’s property and the city. When a new bishop was installed, the bowl was filled with wine and everyone in the city could drink freely. The tradition remains today, except you now have to purchase a cup to get access to the free wine. The original design of the building was based on St. Michael’s Church in Hildesheim, which is also a world heritage site. 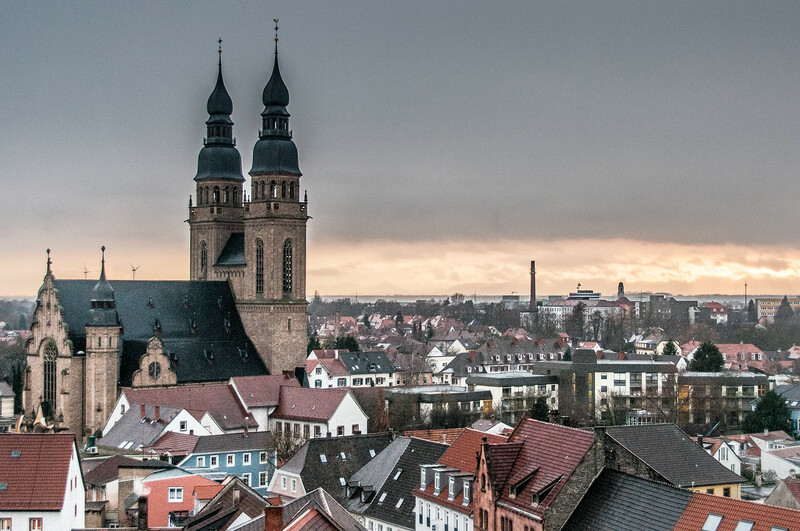 Speyer Cathedral is located in close driving distance to the Messel Fossil Pit and Abbey of Lorsch world heritage sites. The Speyer Cathedral is a cultural UNESCO World Heritage Site in Germany. 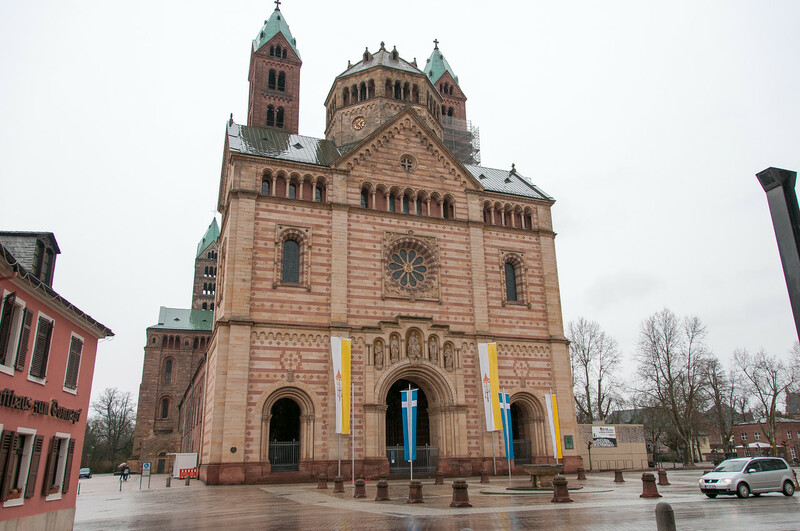 It is a Roman Catholic Church in Speyer, Germany that was founded in 1030. The church features a Romanesque architectural style and was inscribed in 1981. It serves as the home of the Diocese of Speyer in Germany. It is the seat of the Bishop of Speyer. This cathedral was built to honor St. Mary and St. Stephen. St. Mary is the patron saint of Speyer. This church was increased to the rank of a minor basilica for the Roman Catholic Church in 1925. Speyer Cathedral is located in the Rhineland-Palatinate region of Germany. At one point in history, it was considered the largest cathedral in Europe. However, that recognition has long been overcome by other churches in Europe. Nonetheless, it is the largest Romanesque church to this day. The cathedral was constructed during the time of Emperor Konrad II and was consecrated in 1061. In terms of its architectural feature, the triple-naved vaulted basilica is the central feature of the element design. This design approach was believed to have influenced many other buildings that use the Romanesque architectural style in the 11th and 12th century. The main building consists of a nave and transept supported by four towers. This became the model of other churches built after the Speyer Cathedral. If you are visiting the Speyer Cathedral, do not miss out on the ‘cathedral bowl’. It is located just outside the main door of the church. This bowl can contain up to 1,560 liters of water. It has become a custom tradition at the church to fill this bowl with wine whenever a new bishop is named. Many believe this started the Cathedral Wine Fair that is held in the region annually. 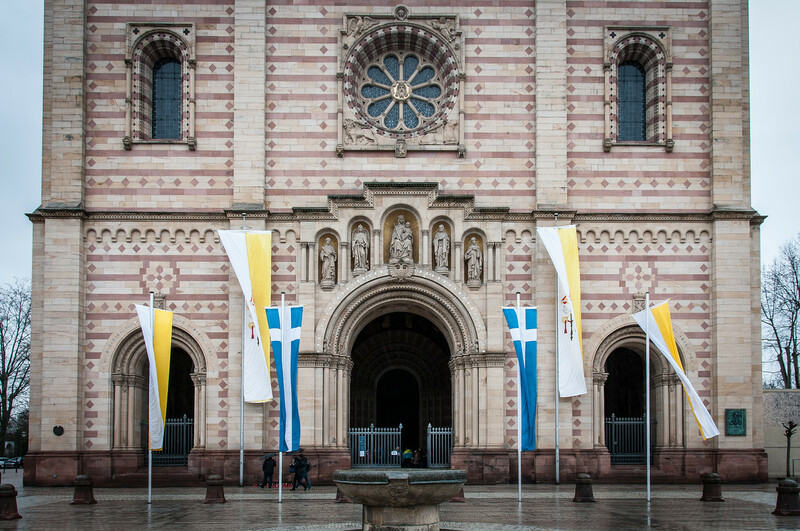 Meanwhile, the Speyer Cathedral also hosts the International Music Festival that is held in September and October. During this festival, there are choirs and orchestras that play before the crowd. View the complete of UNESCO World Heritage Sites I visited.